North Korean leader Kim Jong-un is reportedly sending a "very unconventional" message to the Trump administration. Two South Korean envoys left for the U.S. on Thursday to inform American officials about their unprecedented meeting with North Korea's leader Kim Jong-un. While South Korean officials didn't give exact details on what the two sides will discuss, one big talking point will most likely be the North's reported willingness to discuss denuclearization with the U.S. 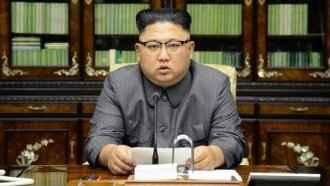 The Hermit Kingdom reportedly made it clear it has no reason to keep nuclear weapons as long as it's not under military threat and its security can be guaranteed. Kim reportedly directed the South Korean envoys to deliver a "very unconventional" message to the Trump administration, but at this point, we don't know what the message is. The South Korean officials are expected to meet with U.S. national security adviser H.R. McMaster. It has not been formally announced if they'll meet directly with President Donald Trump.